What could be more exciting, than playing a favorite game on Christmas? If you enjoyed Canoniac Launcher, that its xmas version is exactly what you need on holidays. Enjoy the game! People expect surprises on holidays, especially if it's Christmas outside your house! If you enjoyed something before, it returns with a better version. Canoniac Launcher delivers incredible experience for people who want to relax on holidays and enjoy playing games. 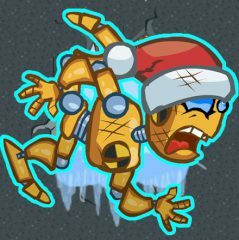 Launch your old good robot, dressed in the xmas outfit!